Home prices, including distressed sales, rose 6.9 percent from January 2015 to January 2016, according to CoreLogic, a leading provider of consumer, financial and property information and analytics. On a month-over-month basis, prices were up 0.5 percent from December 2015 to January 2016. 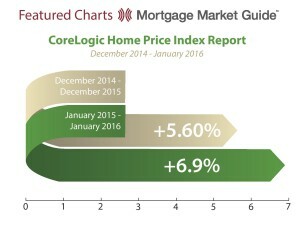 Looking ahead, CoreLogic has forecasted a 5.5 percent increase from January 2016 to January 2017. Serving Bonney Lake, Graham, Sumner, Spanaway, Tacoma | Northwest Mortgage, A Division of Goldwater Bank, N.A.